Where I am staying tonight. There was sea fog on the way from Horseshoe Bay to Nanaimo, Vancouver Island. And sea fog on the way to Gabriola Island too. People are so polite in Canada. We are going to have to sound the fog horn folks, be prepared. Especially if you use a hearing aid! Really, where else in the world would one get this kind of consideration? So I am here on Gabriola Island for just one night staying with long-time supporters of the Order. It is a delight to be welcomed into their lives once again. Their cabin is on the highest point of the island and the view over the water and islands as the light faded this evening was moving. To say the least. Video to follow in a day or so. Onwards to Victoria tomorrow. 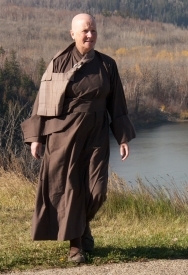 Car ride, Greyhound bus ride, car ride and then into the company of a dear monk who already is an inspiration. Her temple and sangha are treasures, as is she. Valdez Island is the next island south of Gabriola. In 1967 I was there. Flew in and out by sea plane. What an adventure for a youngster, I’m so glad to revisit the area and revisit that adventure too. Looks like the island has returned its old cars to nature. And nature is doing a stunning job.